Posh manager Grant McCann celebrates a last-gasp winning goal with his players at Bristol Rovers last season. Peterborough United boss Grant McCann reckons his side have a great chance of a flying start to the 2017-18 League One campaign. Posh open with a league game against newly-promoted Plymouth Argyle at the ABAX Stadium on Saturday, August 5. Posh midfielder Chris Forrester nods home the winning goal at Northampton last season. They then host League Two side Barnet in a Carabao Cup tie, probably on August 8, before travelling to their first away game on August 12 to Bristol Rovers. A home game with Rotherham and a juicy away trip to local rivals Northampton close out the first month of fixtures. The Posh players are back to work for fitness tests at the club training ground tomorrow (Friday) before travelling to Spain for a six-day pre-season training camp on Wednesday, June 28. “It’s great to start with two home matches,” McCann said. “We are determined to start well and this gives us a good chance of doing just that. “The first game is an excellent one. Plymouth travel everywhere with a huge following so we can start our promotion push in front of a big crowd. “Our first two away games are at grounds we won at last season with late goals so I’m optimistic of a strong start. “I’m pleased to be back at work. As a player, you always feel that the summer break is not long enough, but as a manager, I just can’t wait to get started. 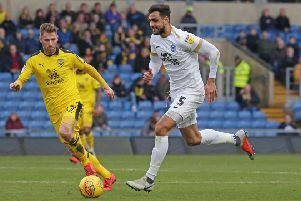 “I have had a good break with the family, even if I was on the phone to Barry Fry or the chairman most days, but it’s time to get back to work. The players are back on Friday (June 23) for fitness testing and then straight into pre-season training on Monday. “The players have all been working hard in the summer anyway. They were all given specific programmes to stick to and they know if they havn’t followed them they will get found out in the first week. Posh finish the season on May 5 at Portsmouth, a game which has a 5.30pm kick off time because of TV requirements. League One title titles odds at Sky Bet (June 21): 11/2 Blackburn, 15/2 Wigan, 9/1 Portsmouth, 10/1 Bradford City, 12/1 Oxford, 14/1 MK Dons, 16/1 Charlton, Scunthorpe, 18/1 Bristol Rovers, Southend; 20/1 Doncaster, Fleetwood, POSH, Rotherham, 25/1 Rochdale, Bury, 28/1 Northampton, 33/1 AFC Wimbledon, 40/1 Northampton, Walsall, 66/1 Blackpool, Gillingham, Oldham, Shrewsbury.